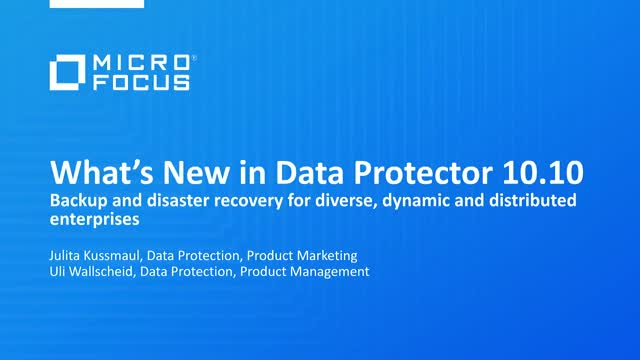 Watch this webinar to learn about Micro Focus Data Protector, centrally managed, enterprise class backup and recovery solution for data in the Data Center, remote office and the cloud. An SAP-certified Data Protector can efficiently address the backup requirements of SAP HANA mission-critical applications. A high performance, scalable software solution, Data Protector offers centralized management, media management, reporting and analytics for performance tracking and resource utilization, enabling automation, higher uptime, cost efficiencies and compliance. This is the first webinar in this series, we recommend you watch this one first. What is my readiness status? A common complaint about GDPR is that the articles are clear about the desired end result, but there is little guidance provided on how to get there. Organizations are thus often hesitant about building out a technology roadmap and executing upon it, especially when resources and budget are scarce. Learn how to break through this barrier by breaking down the complexities of GDPR into specific technology use cases, and then learn how to determine your overall readiness to address each one. How do I identify information for disposition that may be subject to “the right to be forgotten”? You need to be able to identify both structured and unstructured data for disposition that may be subject to the GDPR “right to be forgotten” requirements. - How Micro Focus Content Manager and Structured Data Manager can assist you. How can I cost-effectively respond to legal matters requiring information under my management? A likely by-product over time for organizations that fail to comply with GDPR will be investigations and lawsuits. Don’t develop a compliance strategy without at first understanding potential requirements for such urgent requests for information. Join us to learn best practices for legal holds, early case assessment, eDiscovery/ eDisclosure, so you can turn around requests quickly, with a high level of confidence and cost control, if necessary. How do I reduce my overall risk profile? Join this webinar to understand how Micro Focus’s Adaptive Backup and Recovery suite assists with GDPR requirements to protect your customer information from the core to the edge. This comprehensive suite of solutions combines real-time analytics and guided optimization to help make sure information is backed up at the right time, in the right way, on the right medium based on its relative importance to GDPR requirements—delivering cost savings while meeting strict recovery and service-level expectations. Armed with deep insight into customer data, organizations can streamline and drive cost efficiencies into the process of protecting, leveraging, and taking action on this information. Understand how the application and enforcement of policies to manage information throughout its lifecycle can be achieved using the Micro Focus Secure Content Management suite. Specifically Micro Focus ControlPoint (unstructured data) and Micro Focus Structured Data Manager (structured data). Where is the information and sensitive personal data that may fall under these regulations? You need to be able to quickly and cost efficiently determine what data falls in scope with GDPR, and then apply policies to move, redact, encrypt and dispose of personal data in accordance with GDPR articles. - How the application and enforcement of policies to manage information throughout its lifecycle can be achieved using the Micro Focus Secure Content Management suite. You need a proven, standards-based approach that meets GDPR criteria for the use of encryption and pseudonymisation to protect personal data, without breaking existing business process. To effectively address the GDPR, you need an integrated strategy that can address the complete information lifecycle—from data discovery and classification to enforcing reliable data protection. Encryption, tokenisation and data masking are proven tools for risk exposure reduction that can help you to meet your GDPR anonymisation and pseudonymisation data privacy requirements. Join this webinar, to learn more about Voltage SecureData, and the Micro Focus Data Security portfolio with technologies that include format preserving encryption (FPE), tokenization and key management and how data privacy can be enforced on your most sensitive data for compliance with privacy mandates. Can I report a breach within the timeline required by the GDPR? Sweeping cybercrime related data breaches under the rug is no longer an option. In addition to the impact to your brand and reputation, failure to comply will come with sanctions and penalties. You need to enable Level 1 analysts to investigate alerts faster and with better insights using analytics-driven, guided investigation tools to accelerate both detection and remediation to comply with GDPR notification guidelines effectively. In this webinar, learn how you could use Micro Focus ArcSight to detect and investigate data breaches and identify areas of non-compliance. Join us on our webinar where we will show how businesses can focus on consistently improving the user experience of their mobile channels using Micro Focus application delivery management. Big Data is an exciting concept and emerging set of technologies that hold seemingly unlimited promise to enable organisational transformation, gain new analytic insights and operational efficiencies. It is a unique architecture that enables low-cost, high-speed, parallel processing of huge data sets of structured and unstructured data. When used in an enterprise environment, however, the importance of data security becomes paramount. Organizations must protect sensitive customer, partner and internal information from an increasing array of advanced threats and risks, and must adhere to a complex set of privacy laws and compliance requirements. Voltage experts Anna Russell and Reiner Kappenberger will be on hand to guide you through how Micro Focus has helped the world’s leading Telcos, using real world, big business scenarios and to help you gain an advantage. Public cloud usage is growing rapidly, but it also poses new challenges in monitoring. Join us on this webcast for a panel discussion hosted by Dana Gardner, Principal Analyst at Interarbor Solutions, on the challenges and solutions around multi-cloud monitoring. We’ll discuss the results from the latest Dimensional Research survey of more than 500 enterprise cloud professionals who shared their concerns, requirements, and demands for improving the monitoring, management and cost control over hybrid and multi-cloud deployments. We will also discuss new technologies to solve these challenges. Join us for this 40-minute webinar to find out what the transition to AIOps (Gartner) is all about and why and where machine learning and automation needs to play a part in complex multi-vendor Enterprises. • The story so far – why the IT industry is transitioning from Waterfall to Agile in IT Operations? • Operations Automation – the need for operations automation and what we really mean by it. • Recommendations – what “real” operations automation's look likes via some example practices being adopted by complex multi-vendor organisations. • Demonstration of the Micro Focus solution. What are the real truths? It is an exciting—and challenging—time in the identity management space. Digital disruptors like IoT, the Cloud, Hybrid, Blockchain, Shadow IT, DevOps, and more suggest a big change in identity management. What does that change look like? - To start over, or evolve? - Are current identity management practices fit for purpose? TravelBird, a Dutch based online travel platform that offers daily holiday deals over Europe, will share their best practices to leverage real-time analytics and automation to deliver 100% personalized deals for customers, increase deal conversion and optimize offer content and pricing. TravelBird runs an integrated business intelligence and advanced predictive analytics architecture by leveraging Vertica along with tools such as Tableau, Spark and Python over a full cloud infrastructure. Rob has a unique record of accomplishment in BI, Analytics and Data Science for industries like travel, gaming and retail commerce with roles in major online companies such as Spil Games and De Bijenkorf. We help you bridge the old and the new so that you can take advantage of all technologies.